The Problem: Each year, more than 250,000 sea turtles are accidentally captured, injured or killed by U.S. fishermen. These injuries and deaths take place both while turtles are migrating through fishing areas and in fishing areas that are used as feeding grounds by sea turtles. Trawling involves large funnel shaped fishing nets being dragged in the water behind one or more boats. These trawl nets catch all marine life indiscriminately. Turtles can become tangled in the nets and then drown after being held under water for too long and cannot reach the surface for air. They can also sustain internal injuries from hooks or external injuries from entanglement, including strangulation or amputation. The ropes used by fisheries can also entangle and drown them. In the U.S., the National Marine Fisheries Service (NMFS) requires all U.S. trawl shrimp fishing vessels, and any foreign trawl shrimp fishing vessels that want to sell their product in the U.S., to be equipped with Turtle Excluder Devices, or TEDs. TEDs are two-dimensional net inserts with large escape openings. Trawls are wide-mouthed nets that taper to a small end to hold the catch. When turtles are captured in the trawl they strike the grid bars and are pushed through the opening. When working properly, TEDs can reduce turtle captures by 90 percent. However, TED's are not currently required in non-shrimp trawl fisheries, which continue to catch and drown sea turtles. Many of these nets can scrape the bottom of the ocean floor, damaging and completely destroying the delicate ecosystem of coral reefs. As it stands, the global fishing fleet is currently 2.5 times larger than what oceans can sustainably support, which shows how big a threat commercial fishing practices pose to turtles. In 2004, the National Marine Fisheries Service (NMFS) identified more than 70 fisheries, operating in state and federal waters, as potentially harmful to sea turtles. 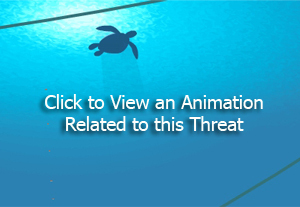 In the United States, sea turtles are protected under the Endangered Species Act. Beyond U.S. waters, there is no enforced law to initiate and support bycatch reduction programs. Nevertheless, the growing international interest in reducing bycatch is motivated by numerous factors such as appreciation for endangered species and concern for maintaining marine biodiversity. The economic interest in preventing future environmentally-based fishing embargoes such as the U.S. tuna embargo (a ban on foreign-caught tuna caught by setting on and killing dolphins) also encourages governments and fishermen to reduce sea turtle capture in fisheries. Bycatch is a serious threat to sea turtles because it can occur anywhere in the ocean, making it hard to implement a multi-national agreement that improves equipment requirements. The Solution: The use of Turtle Excluder Devices in all trawl fisheries, not just shrimp. Time and area closures have been instituted in the scallop dredge fleet and various gill net fisheries to protect sea turtles. * Inform and encourage family and friends to purchase seafood from responsible fisheries. Case Study: In September 2006, the U.S. government authorized 25 fisheries to kill about 10,000 sea turtles and injure 334,000 each year! This doesn't account for all the companies that fish on the oceans as these were the only ones assessed by the federal government. This study found that even if the companies reach the limits specified the operations are not shut down, the limit simply gets raised. The report also stated that some trawl fisheries catch up to 12 times the legal limit. There is currently legislation in place called the Magnuson- Stevenson Act to placing regulations on bycatch. Read the report (pdf file).